He’s been regularly bouncing between the horror and suspense-thriller genres for decades, but bestselling author Dean Koontz’s latest volume once again sees him aiming towards the weirder end of the mainstream horror market, with some enjoyably unpredictable results. 77 Shadow Street might start out as an oddball twist on the haunted house story, but the plot soon throws in a selection of head-spinning SF twists, as the well-off inhabitants of the Pendleton – a block of expensive condo apartments at the titular address – experience a series of increasingly bizarre ghostly visitations and transformations. It all seems connected with a series of violent events in the Pendleton’s past, and for a while it seems like a typical haunting – but things get even stranger when the building is dragged onto a distorted, devastated version of Earth populated by nightmarish monstrosities. Here, the various apartment-dwellers have to join forces against the deadly creatures hunting them down, as well as facing the apparently god-like entity known as “the One”. Featuring ickily well-imagined creatures and some effective menace, the book keeps the pace high while also maintaining a fine level of lurid strangeness. Koontz pulls off lots of well-executed suspense set-pieces, giving the reader plenty of action and gory shocks, but while it’s never less than readable, the story’s large ensemble cast is a little too large, and the storytelling ends up feeling unwieldy and lacking focus. Plus, while the central mystery is clever, the big reveal is a bit of a let-down after the menacingly ambiguous build-up (and weirdly reminiscent of Michael Crichton, of all people). 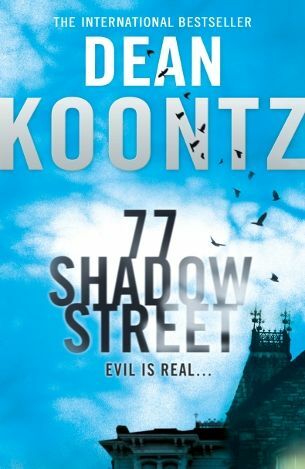 Koontz is still firmly in the shadow of authors like Stephen King, but even if the final destination isn’t ideal, the ride itself remains an entertaining one, making 77 Shadow Street a good choice for anyone seeking an undemanding horror page-turner.